Woohoo we spotted yet another Garnier Whole Blends Free Samples portal! This is yet another chance to request this product for free to try out! There are 20,000 samples available. 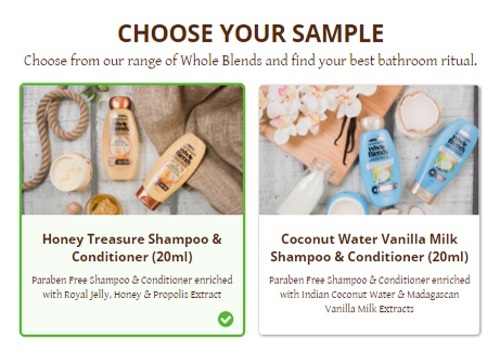 Choose from Honey Treasure or Coconut Water Vanilla Milk Shampoo and Conditioner (20ml). Sign up and claim a Free Whole Blends Sampler Pack for yourself and/or send a sample to a friend! Allow 6 weeks for delivery. Offer ends March 13, 2016 or while supplies last. Please note this offer is separate from the other two that we posted, you can request this if you can requested the others. You can also still request ANOTHER Garnier Free Sampler pack from this link from an earlier post. It looks like you are not eligible for this promotion. Please refer to the Offer Terms & Conditions. I did request their previous sample. Do you have at least 10 friends on Facebook? Take a look at the fine print of the offer. This sample offer is completely separate from the others, I could request this one (and the rest) with no issue. Also, you could contact Garnier on Facebook and ask them specifically what the issue is.